The two most popularly grown chamomile varieties are German chamomile (Matricaria recutita) and Roman chamomile (Chamaemelum nobile). Roman chamomile is often used as a groundcover or creeping plant used to soften the edges of a stone wall or walkway. Roman chamomile is a perennial plant. The German chamomile, discussed in this article, is the annual herb used for making tea. German chamomile is a delicate looking plant that is surprisingly tough. It has an almost wildflower look about it. The fragrant flowers are daisy-like with white petals surrounding a yellow disk. The stems are not particularly strong and bend and flop as the plant grows taller. German chamomile is grown as an annual, but it will self-seed and can be quite aggressive if left unchecked. If the flowers are harvested, invasiveness shouldn’t be a problem. German chamomile is an annual plant, however, it self-seeds so readily, you might think it's a perennial. Roman chamomile is a true perennial hardy to USDA Hardiness Zones 3 to 9. 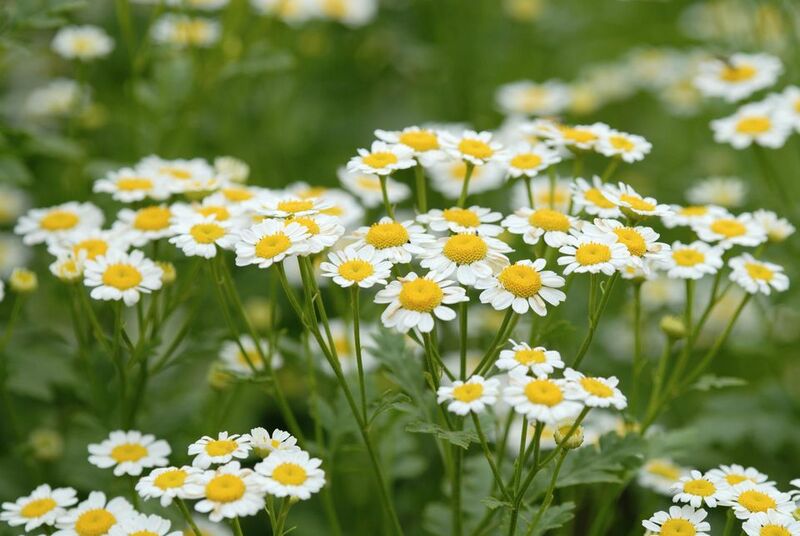 German chamomile will grow in either full sun or partial shade. The plants flower best in full sun, but in hot climates, partial shade is a better choice. German chamomile tends to be a low growing, creeping plant that reaches a height of 8 to 24 inches. Flowers generally appear in late spring, but if you are pruning the plants or harvesting leaves, blooming can be later. Chamomile will flower best if grown in full sun and not too rich, organic soil. It will survive in poorer soils, but the stems will be that much floppier. Chamomile is not particular about soil pH, preferring a neutral range of between 5.6 and 7.5. German chamomile is easy to start from seed. Start seeds indoors, about 6 weeks before the last expected frost. Chamomile seed needs light to germinate, so simply scatter the seed and press firmly onto the soil, but do not cover the seed with soil. Seeds should germinate in 7 to 14 days. You can also direct seed German chamomile outdoors. You’ll get better germination if you do this in the fall and let the seed stratify over winter, for a spring crop. Both the flowers and the leaves of the German chamomile plant are used for making tea. Harvest the chamomile flowers when they are fully open. They can be used fresh or dried and stored for later use. If you find the leaves make your tea a bit too bitter, leave them out and just harvest the flowers. Chamomile isn't great as a bedding plant. It tends to be too floppy and insignificant when paired with more formal and imposing plants. It can be used for underplanting in the herb or vegetable garden and is a good candidate for pots, where it’s easily accessible. German Chamomile (Matricaria recutita) - You won't often see named varieties of chamomile. Regular water will keep the plants in bloom longer, but chamomile plants are very drought tolerant, once established. In extremely hot climates, chamomile will appreciate being kept watered and getting some afternoon shade. Most insects stay clear of chamomile. In fact, it is used as a cucumber pest deterrent. However, aphids and thrips can sometimes be a problem. Both can be washed off the plant or treated with insecticidal soap.